It's always good to review the reasons to be grateful around this time. Funny, but it's really good to do this daily. I even saw a trend on Facebook with some of my friends to post something every day that they were grateful for. 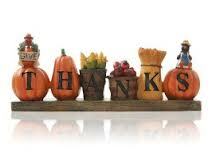 So now we have a holiday about expressing gratitude. It always kind of makes me laugh. Like Mother's Day - one day to honor mom, when it would be nice to be treated with respect every day. Many of us do anyway, so why one day a year? To make sure we get to it? Plus, I kind of have weird feelings about Thansgiving's origins....but I'm not going there right now. Here are the top five on my list. Please read them, and then post your top five as comments here below this blog post, because we'd have a really nice long list if every reader added five! A supportive husband who very agreeably and competently cares for our four kids those weekends when I go to expos or meetings in Columbus, or teach out of town. He's a great partner and a wonderful father. Mazel Tov...and now what do I say? This weekend is my 13 year old daughter, Rayna's Bat Mitzvah. As the mom of the Bat Mitzvah, I'm supposed to say a few words to my daughter in front of the congregation during the ceremony. I'm struggling to decide what to say. I mean, of course, "I'm so proud of you, you're such a beautiful young woman inside and out, and you've grown so much" come to mind. But beyond that...I'm feeling stumped. This ceremony is special and important for my daughter, certainly. She's done a very dedicated job preparing and I know she'll lead her parts with grace and competence. But to me, really, this ceremony is more about a coming of age than a spiritually uplifting event. Family and friends are coming in from out of town and locally to attend. They'll all be so proud of Rayna, congratulate her on her accomplishment. Look at what she did: she learned a lot of prayers in Hebrew. And she can lead them confidently in front of friends and family. She learned her Torah part and wrote a nicely educational speech with a dash of humor. Well done. I acknowledge with some relief that other people will find this more spiritually meaningful than I do. Rayna and her siblings are being brought up a little differently from other Jewish kids at their school. In addition to learning and practicing Judiasm, my kids do Reiki. 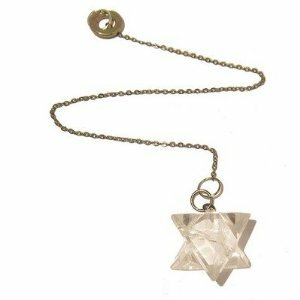 At home, they also talk about angels, crystals, and know how to use pendulums and Tarot cards. I think they already are far more spiritually advanced at their age than I was with a Master's Degree in Jewish Studies at age 37. So what can I say in front of this congregation, that will be sincere, and also inspiring in some way to my daughter? I guess I could focus on what I want for her. I hope that she will always be proud of who she is. I hope that she will continue to grow and listen to her heart. I hope that she will always know that she has permission to question and wrestle with everything she is taught...even by me. Last night I attended a Fire Ceremony. A man named Ljubomir Rozic has these Shamanic ceremonies at each new and full moon. There's a bit of learning about a healing concept, a meditation, and then the fire. He teaches everyone to touch the fire and bring it into their heart chakra (there are no burning or special effects involved!). We also put a list into the fire of things we would like to remove from our lives. Then Ljubomir changes the frequency of the fire to manifestation, and we put (either symbolically or physically) into the fire a list of things we want to manifest into our lives. By the way, it was pouring rain last night, and we still gathered and did the ritual. This was my first time going, and I really liked it. It was also my husband's birthday. He wanted to go (to my surprise), and also really liked it. 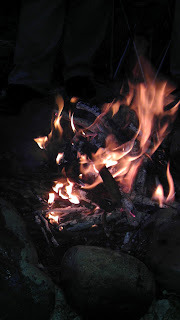 I've been thinking lately that I have lots of things in the fire (symbolically). You know the expression "A lot of irons in the fire"? That's what I mean. I've got a lot of irons in the fire, and I'm waiting to see what's going to come out. The things I have in the fire are all things that I've applied for, or inquired about, and am waiting for results or answers. I applied to be part of the new Transdisciplinary Holistic Care Education Program at the Cleveland Clinic. This includes specialized training in holistic patient care, rounds, case studies, and lots of direct experience in being an advocate for Reiki and holistic care in the hospital setting. Only CCF staff and volunteers from the Healing Services Department were allowed to apply. I sent in my application to teach in Lily Dale for the Summer, 2013 season. I've been invited to be a practitioner for a research study on comparing the effectiveness of acupressure vs. Reiki for people with Gulf War Syndrome. I completed all necessary forms as asked. Funding should be approved (or not) in two months. I pitched an idea for a board game to a game company. They received it and will get back to me...whenever they do. I am beginning to plan a very big two day Practical Reiki training weekend for April, 2013. The goal is to have at least 100 participants. I'm looking for a venue, interviewing holistic event marketing professionals, and waiting for people to get back to me. 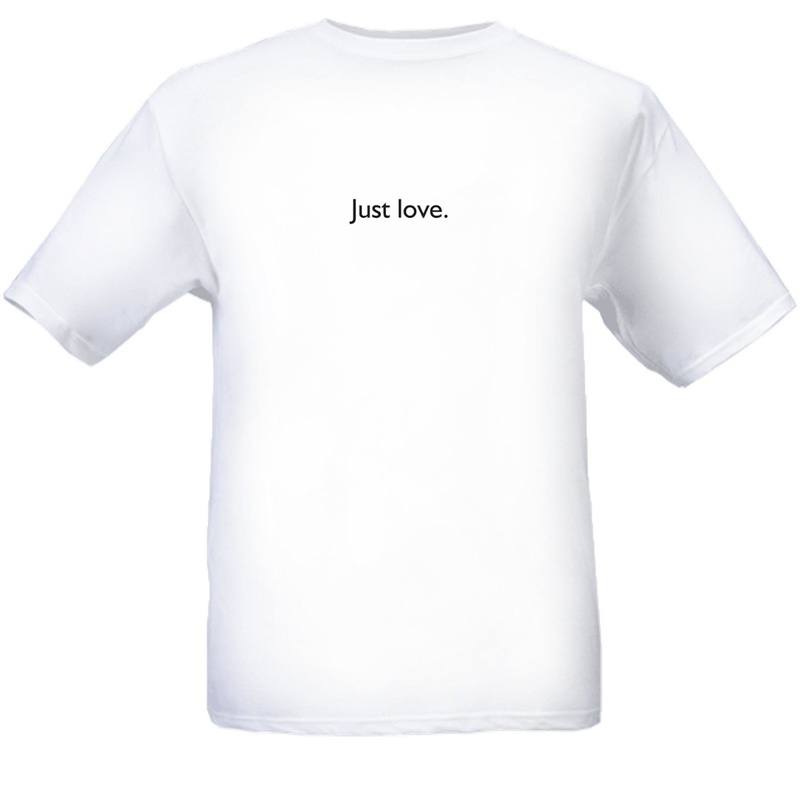 I'm starting a project, called the Just Love Project. There will be t-shirts that on the front say "Just love." 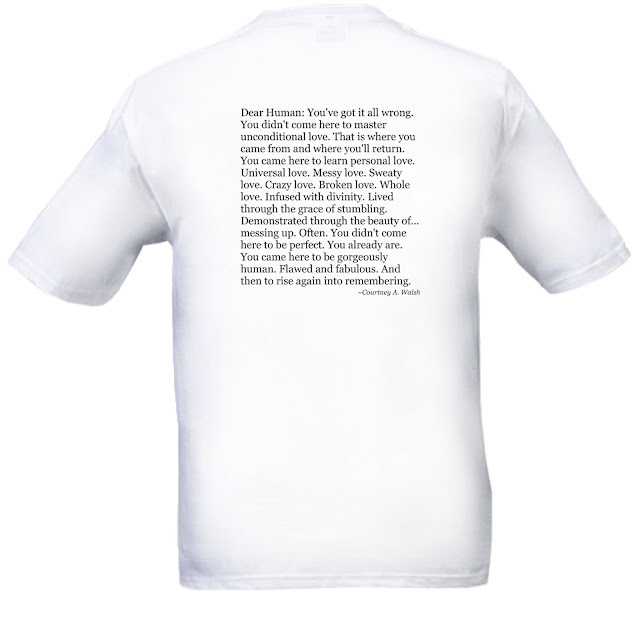 On the back, will be a variety of quotes, cartoons, and specifically chosen artwork that fits the theme. The writers and artists who created the selected works for the back will also be featured on the website. 100% of the profits from the series of shirts will go to charity. Each quarter, we'll change to a new charity. The idea is to spread messages of being loving and kind, while also doing something more to help those who need it. I've initiated contact with the first couple of artists and writers whose work is fitting, and am waiting to hear if they are willing to participate. I had one shirt made to see how it would turn out. It arrived yesterday. Stay tuned for a more official launch...whenever it's together. I've got the website, the manufacturer, and the idea. Now I'm waiting to see who will participate so I can get to work on the website details. So, these are a lot of works in progress, and my need for patience is at a premium. There's such an element of surrender in waiting. I'm very much an action person, and those of you who've read my blog over the last few years (bless you all!) know that this is one of my life lessons. Meanwhile, I'm working on things that need action now - teaching, giving Reiki, promoting events, finding a venue for my big spring Practical Reiki workshop, etc. Of course, there are personal life things going on always too. 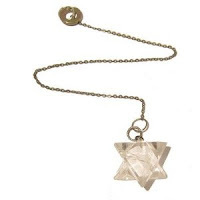 Next month is my oldest daughter's Bat Mitzvah. There are school activities, homework, lunches, grocery shopping, chores, and a big group of holidays to observe in the next few weeks. So I breathe. And put myself back into the space of the present moment. 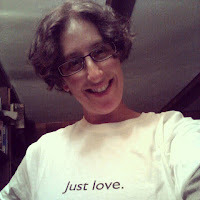 "Just love," I remind myself. It's all about that. And, I'll let the fire ignite, offer, and shape what's been placed in there. I look forward to seeing what emerges, all in the right time. At the end of August, I had the wonderful opportunity of teaching Practical Reiki at the Lily Dale Assembly in Lily Dale, NY. It was a fantastic time. The class was the largest number I've ever taught in one group. Their ages ranged from 19 to about 80-something. My class included a mix of people new to Reiki, Reiki Practitioners, Reiki Masters, and practicing Mediums. The absolute best thing was the joy and enthusiasm with which Practical Reiki was universally met. I was told repeatedly that it was "refreshing" to have a "real person" teaching this. (That made me laugh!) I had the opportunity to meet privately with 13 of the 20 students, and get to know them better. I heard about their lives, and offered some intuitive advice and instructional support. I loved it. I left feeling like a rock star. I realized that Practical Reiki is more needed, and has the potential to help more people than I had ever imagined. It confirmed for me that I'm really here to bring a simple and powerful way of healing to the world. People new to Reiki discover an immediate connection to the energy that they can instantly tap into. People who know other Reiki modalities discover an easier way exists - one that spells out what took them years to figure out on their own (because they were taught differently) - and an additional frequency that strengthens their own energy work. And people who were intimidated about teaching Reiki because they learned a complicated process of symbols and ritual are now empowered to teach it "straight up" - as I do. Practical Reiki needs to be big, and it's time to share it with more people on a bigger scale. 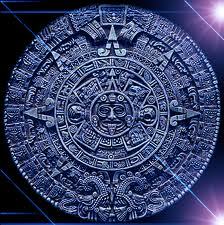 So now, I'm starting to think big, and have begun to plan my first two-day Practical Reiki training for Spring, 2013. This will be an event that people can travel here (Cleveland, OH) to take, and it will be a weekend. I'll get good rates for blocks of rooms at nearby hotels, and make it as easy as I can for people to get here. It's time, the guidance pushes me, and I'm listening, and feeling the little nervous flutter in my stomach that means that it's exactly what I need to do. The Lily Dale experience taught me something really important, and today I saw it as part of the bigger lesson about life that applies to everyone. Man, when I ask for inspiration for my next blog post, I get it!! This morning, as I perused Facebook (better than the morning paper! ), I found this. I realized that it's the truest thing I've ever read, and it's also the overarching theme of the bigger picture I've been shown. I wish I knew who wrote it, but I have to share it regardless. Whoever you are who wrote this, I send you gratitude and admiration. I needed to read this. It gave me the courage to move forward with this bigger-than-I've-ever-done thing, and face the voice that counters with "are-you-really-worthy?" Because it's love that is moving me to action. Love for this role I've taken on to share Practical Reiki, but more so, to help people find that inner power for healing that was there all the time (right, Dorothy? Of course, says Glinda). It's love that I receive from the grateful emails that pour in from my students. And the feeling of being connected to this great big LOVE that is the light I'm connected to when I'm teaching, sharing Reiki, and attuning people. This quote also gives me permission to make mistakes as I move forward. It's so accepting and forgiving, and it gently takes my little snarky background voice and wraps it in a cocoon of love that soothes it to sleep...for a while. So that's my message today, and as always, I share it with you, in hopes that it will inspire you to go for that big dream of yours that's fueled by love. 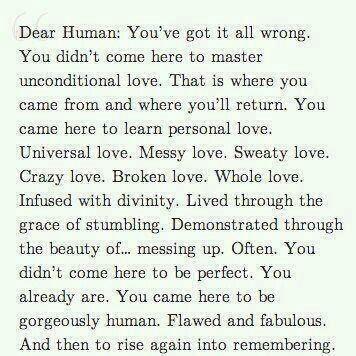 You didn't come here to master unconditional love. This is where you came from and where you'll return. I simply love this quote so passionately that I've ordered a tee-shirt with the part of the quote I posted originally on the back, and "Just love." on the front. If anyone would like one, I'll order you one and ship it to you for $25 free shipping (inside the continental US). Be sure to indicate size (S/M/L/XL) when ordering. Here's a picture. $25 and free shipping. Let's start a love movement! I first learned Reiki in person from a teacher, and took the Master/Teacher level in a class, in person. It was traditional Usui Reiki training. I found that my training left some things to be desired. There was no instruction on intuition, for example, or chakras. I was not taught how to feel and experience energy, just taught traditional hand positions, symbols and ritual that "had to be" done in order to give a Reiki session. Three months later, I learned Kundalini Reiki, by distance, online from the founder of the system. I felt my attunements more strongly than I had felt any other, ever. I also learned that symbols, hand positions, and ritual are not needed in order to practice Reiki. Although this conflicted with my Usui Reiki training, it made more sense to me. I spent lots of time pondering and practicing after this. And the pondering and practicing really helped me the most in developing my understanding about Reiki, and how it can be effectively taught so that people can learn to feel the energy and understand what they are doing. Since that time, I've taught over 500 people Kundalini Reiki or Practical Reiki. I've written two books about Practical Reiki, to help those who want to learn get a more thorough education in energy healing. I have received only powerful, positive feedback from all of my students and clients. I'm proud of my work and am committed to being a dedicated and approachable teacher for all who learn from me. My students share the love of Reiki, whether they were previously Usui Reiki trained or not. At times, I've been informed (and even involved) in online discussions about what's "better," in person or online training. As I've said there and will say again, it depends on the teacher. It also depends on the student's comfort level, but I do my best, even with online teaching, to provide the most personal experience possible for my students. Not all online training is equal, just as not all in-person training is equal in quality. It depends on the teacher being of high integrity, knowledge, approachability, and dedication. Now there's another issue that my students are facing, as well as others who receive training online. Some hospitals and other organizations who accept volunteers to provide Reiki will only accept individuals who have received training in person. Others will only accept individuals who have received Usui Reiki training. Practical Reiki (and other methods) are not treated with the same respect. So what are my wonderful students to do when they want to go out and dedicate their precious time to sharing Reiki in these places? I guess we need to start a grass roots movement to establish cred and overcome the stigmas held by those who think that Usui Reiki is better than Practical Reiki, or that in person teaching trumps online learning. Yeah, we've got our work cut out for us. If you're faced with a challenge such as this, don't give up. Politely request a meeting to discuss your training and demonstrate your expertise. Show the person in charge my book, and encourage them to read it. Offer to give the person a Reiki session. Talk clearly and confidently about your understanding and love for Reiki. If that doesn't work, don't worry. Send in your students, your friends who have learned, and others to do the same. Eventually, we'll get a second look. If you want, have the person you meet with contact me. I'll be happy to talk about my year at The Cleveland Clinic, and my two years at The Gathering Place (a support place for families touched by cancer). I'll also be happy to talk about my Practical Reiki for Nurses course, which is approved to offer 8 CEs by the Ohio Board of Nursing. We are the change we want to see in the world. 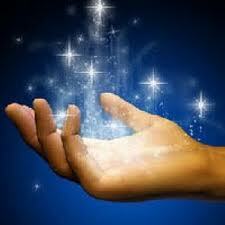 Reiki is healing energy, and the practitioner is the one who has the ethics, experience, and attunement to share it. Let's move the world with our light. In response to student request, I've created a workbook for Practical Reiki students and teachers. It's called The Practical Reiki Companion, and it's now available! Also, I realized that the process of writing down reflections creates an important change for the student. If you know that after you complete this healing session, you will be writing down what you experience, think and feel, you will be in the mindset of paying attention during the session. The "assignment" cues your left brain to stay focused and present, which in turn increases your ability to tune into the right brain's feed of intuitive sensations. It's amazingly powerful as a tool for mindfulness and strengthening your intuition. This process will accelerate your ability to feel the strength of the Reiki energy. 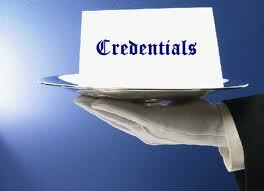 My goal is to empower every student with confidence in his or her ability to work with Reiki. This workbook is designed to do exactly that! It's also an excellent tool for the student who completes Practical Reiki training and wants to teach others. Having the logs of your attunement experiences and healing practices will enable you as a teacher to reflect and share some of the unique and powerful experiences you had while learning, thus enriching the learning for your students. And I've also included several attunement logs for the teacher, so it's easy to keep track of how passing on attunements went on the teacher and student end. This workbook is designed to take you from beginning the journey to helping others to do the same. I'm proud and excited about the Practical Reiki Companion! Those who have had an advance peek, and the first student who is currently using it and giving me feedback all share this excitement. If you've already learned Practical Reiki, I encourage you to get one to transfer your notes from your learning into this keepsake. If you're beginning to learn Practical Reiki, you need this. It will help you, empower you, deepen your learning and accelerate your growth. If you're teaching Practical Reiki, this is for you and for your students. You will be a stronger teacher and your students will be successful because this tool will be part of their journey. 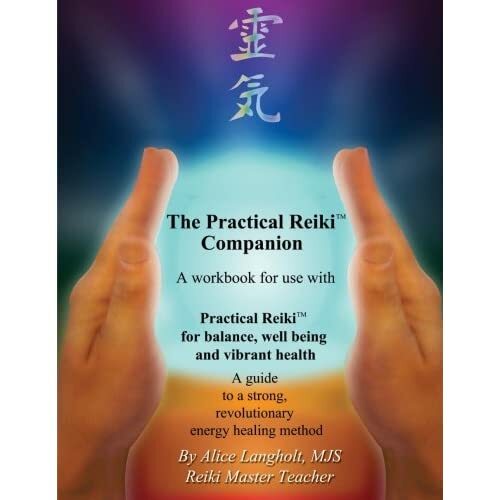 Thank you to the students who encouraged me to create The Practical Reiki Companion and waited with excitement. It's here! Thank you all. It helped me learn so much about learning to write this, and I know it'll be a great service to Practical Reiki students and teachers around the world! The last week in May, my family went on vacation, and stayed in a quiet little beach house in Sandbridge, VA for a week. It was lovely to be by the ocean and have some time away. I had brought my netbook, in the hopes of blogging and getting some other writing done a little bit each day. However, that was not to be. My hard drive crashed and died the first day of the trip. That left me with the books I had brought. Not a bad trade. I'd like to present to you with some of what I learned from having time to read some really fascinating books! This post will highlight the first of three books I read. 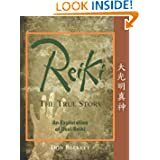 The first book I enjoyed is "Reiki: The True Story: An Exploration of Usui Reiki" by Don Beckett. In this book, I learned all about the "original" of the "original Reiki method." That is, Reiki the way founder Mikao Usui taught it. I found out something really fascinating!! Mikao Usui did not use symbols. He did not use hand positions. Reiki was meant as a personal enlightenment practice. Healing was a side benefit, and it was done by intention. Usui taught different people individually, and each was taught a little differently from the last, because Usui varied his teaching to fit the experience, frame of reference, and ideal usage of Reiki for each student. There was no formalized system, no defined rituals. This is extremely significant to me for a number of reasons. First, because Practical Reiki, the method that I use and teach, does not use hand positions or symbols. Its main emphasis is on intention and attention. Quiet, gently focused observation is the best state of mind for practicing. It sounds to me as if Practical Reiki is very much like Mikao Usui's Reiki. Second, Usui Reiki as it's taught in the United States, follows Mrs. Hawayo Takata's teaching method. She brought Reiki to Hawaii and introduced it to the West. She taught structured ritualized Reiki, including the addition of hand positions, symbols, and lots of formalized procedures. Practical Reiki differs so much from this version of Usui Reiki that many have treated me as if I am teaching a rogue or rebellious form of Reiki - as if I'm going against tradition by not using those things. Takata's method of Reiki, which is also William Rand's version, the most commonly taught in the US and many parts of the world, has become accepted as the "original authentic Usui Reiki." But I have just learned that it's not. Turns out that Practical Reiki is closer to the original Usui Reiki than the method most accepted as the one that's widely taught here. Not sure whether to laugh or yell, "SEE!!!?" I believe I did both several times as I read. While in VA, my family visited the Edgar Cayce Institute in Virginia Beach. It's a really fascinating museum and huge metaphysical library dedicated to the work of a man whose channeled information filled hundreds of volumes of texts. I brought a few copies of my book, and soon as I showed it to the woman who runs the gift shop, she immediately placed an order for the store and asked for an autographed copy for herself. Two visitors to the museum who were nearby asked if they could buy a copy from me too, and I gladly shared. It was a great experience, and helped to validate that what I'm teaching is needed and meaningful. I'm training Practical Reiki instructors now as well as students, so that more people can share this accessible healing modality. And Usui was right - it's a method to personal enlightenment besides being an excellent way to help oneself and others receive healing. My Practical Reiki for Nurses course is approved by the Ohio Board of Nursing to offer CEs to nurses and massage therapists. I'm training instructors for that course too. Reading Beckett's book was like a nod from the Universe and a blessing from Mikao Usui himself. More book reports will follow in future blog posts! Are you a go-getter? Do you know how to excite people and motivate them to action? Do you know the meaning of these words: Reiki, intuition, holistic, and metaphysical? This summer internship experience will give you the title of "Recruiter" for the Reiki Awakening Academy of Intuitive Development, a cutting edge online academy. Use all of your social media, personal and online marketing savvy to bring in students, and you'll get paid a percentage of each new student's first registration for a class. The more students you recruit, the more money you make. Students only need to register for one class, whether $40 or $400. Flexible hours, work from home. This is an ideal position for a college student, but anyone qualified may apply. To apply: First, visit and explore http://reikiawakeningacademy.com. Then, send an email to info@reikiawakeningacademy.com describing why you're the person we should select. Applications will be accepted until May 31, 2012. Position will begin mid-June through mid-August with possible continuation. I'm writing today to extend thanks to some special people who have been supportive to me in many ways behind the scenes and alongside me. By sharing their awesomeness with you, I hope that you'll also check them out. They can help, and the connections will be a win-win for you and them both, as it was for me! Jeff is awesome because he not only teaches a powerfully relaxing and healing type of massage, but he also offered me the chance to teach (twice!) at his beautiful school. He also learned Practical Reiki from me and incorporates it into his work. He's a sweet, personable guy too. Jeff developed a massage technique called The Kates Method. His students rave about what a great teacher he is. If you're in the Cleveland area and interested in learning massage, check him out. Charley is a friend from High School days, and we recently became reacquainted at a computer store. Since then, he has repaired all of my family's computers, helped me choose a netbook (including purchasing it, upgrading it, and loading it up with software! ), picked up and delivered to my house in amazingly fast amounts of time too. He offers a whole huge line of computer and internet related services. And best of all, his prices are totally affordable. I'm thrilled to recommend him. He can even help you remotely if you're not in the Cleveland area. Raizel is a friend, and one of the great teachers for my school, Reiki Awakening Academy too. She is a fun person, a master aromatherapist, and has incredible vision too. She has always been helpful in coming up with great ideas for getting the word out about the Academy. The granola she makes and sells, by the way, is amazingly delicious and includes aromatherapy techniques for balancing chakras too! Check her out - she's just amazing. Happy to pass along positive energy for positive people! 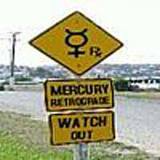 Since I've known about Mercury Retrograde, it seems that a spotlight is shining on all of the delays, technical glitches, and communication gaps that happen during this period every time. And I'm wondering about it. Here's what I'm wondering. The slight over-sensitivity to all things wonky is making these incidents memorable. What I mean is, because I know it's Mercury Retrograde, does that make me more aware of their existence, and subsequently more annoyed by them? Last Mercury Retrograde, I felt like my life was completely kicked around. My computer had issues, my website had issues, my phone had issues, payments were delayed...and I was exhausted from it all. Everything that happened, I remember blaming on Mercury Retrograde. When it was over, things seemed to be back to normal. But back to normal doesn't preclude some things going wrong. That happens. But they don't seem to have as much of an impact when I'm not so hyper aware of them. Is my awareness that it's Mercury Retrograde, and I know that things could go extra-glitchy, actually manifesting these extra glitches? I have learned that the energy of expectation is a powerful creator. I know that first hand. So if I'm expecting glitches, does that logically mean of course that's what I'll be getting? Our minds are naturally prone to trying to make sense out of life. We look for patterns and derive meaning from them. When things are consistent or predictable, we feel safe and like the world has order. So wrapping a lot of chaos into a package labeled "Mercury Retrograde Strikes Again" is somehow reassuring. But are these things really happening because of the shift in planetary motion, or are we just organizing them that way in our little insecure brains? When I lived in my blissfully ignorant about all things Mercury Retrograde state, I don't recall having such intense 3 weeks of wonky. Maybe I should try ignoring astrological warnings for a change. My husband reads the daily horoscope in the paper. He used to get kinda discouraged at the start of the day if the horoscope predicted a mediocre or unpleasant day. I would tell him to not read it, because it would set him up for that kind of day. It's a cause and effect idea, or maybe the chicken and the egg. Is the planetary placement setting us up for a problematic day, or is knowing about it setting us up? Or if we have a strangely glitchy day, should we read the horoscope then to try to make sense of the seeming randomness? "the surface of the Earth contains limitless healing energy. Science has discovered this energy as free-flowing electrons constantly replenished by solar radiation and lightning. Few people know it, but the ground provides a subtle electric signal that maintains health and governs the intricate mechanisms that make our bodies work-just like plugging a lamp into a power socket makes it light up." Being aware of the difference between being "grounded" to the earth's energy and being "ungrounded" is important, especially to those who work with healing energy. See, we spend so much time connected to the higher vibration of healing energy, that after a while, we can feel a little "floaty." Some may start to feel forgetful (ever been an "air head"? ), clumsy, or just really distracted. 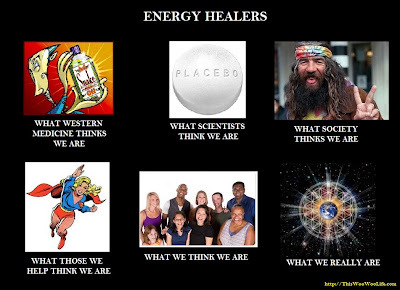 All of these feelings and results are because we need to get our energy fuuly back into our bodies. If this sounds strange, think of being on a boat for a long time, and then coming back onto land. It feels weird, right? That's because we got temporarily used to being gently rocked around on the water instead of firmly anchored to the ground as usual. Same would happen if we spent about 30 minutes walking around on a bouncy trampoline, and then got back onto the land. Temporary physical disorientation occurs. A similar thing can happen if we spend a lot of time working with higher chakra energies. This means meditation, Reiki, or other intuitive practices. Come to think of it, even "monkey mind" can take our awareness away from our bodies. (We all have times of the day with monkey mind - it means that our thoughts are chattering away constantly as we try to remember everything we need to do, what was said before, where we're going next, and how to handle various issues, on and on.) When we find ourselves dropping things, bumping into door jams, and stepping on objects on the floor, it's a signal that we need to stop and ground our energy, bringing our awareness back into our bodies. The best way to do this is by connecting, intentionally, with the energy of the earth. If we could walk around barefoot all the time, we'd be more naturally connected with earth energy. It would help immensely with being more grounded and receiving the healing benefits of this energy. Interestingly, the Reiki method that I teach, Practical Reiki, is developed from Kundalini Reiki. Kundalini Reiki combines the earth energy with the Ki energy from above, and the healing properties are enhanced and strengthened by this combination. So the benefits of earth energy are found in the healing method I teach and practice. That's where these unique and brilliant sandals come in. Juil is a new company that understands the concept of grounding, and they've taken it to the feet. They realize that sometimes we need to wear shoes. But shoes have soles that are typically made of rubber or other insulating materials which separate us from the energy of the earth. 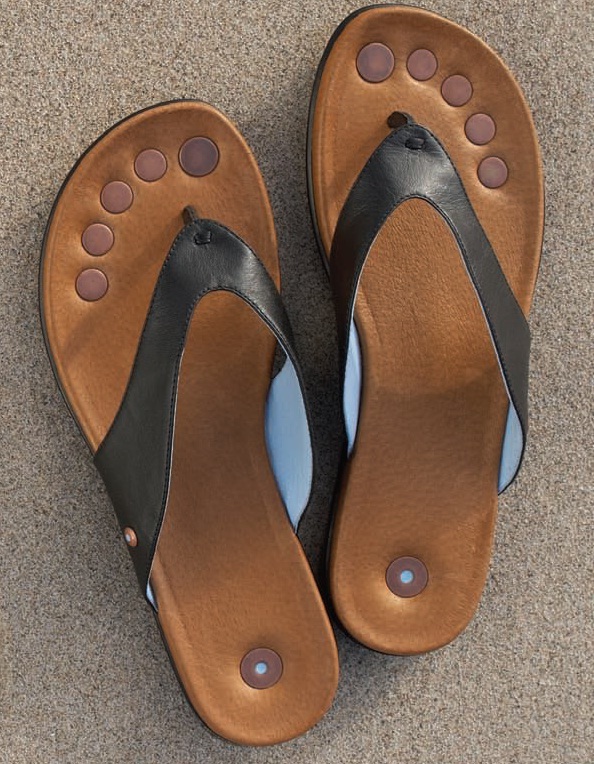 The folks at Juil have developed sandals that have copper conductors beneath the toes and heels, connected inside the leather sole. The conductors sit on the outside of the bottom of the shoe, so every step brings the grounding effect to the wearer, allowing her to be grounded while wearing shoes. I had the privilege of testing out a pair of Juil sandals. Many thanks to the folks at Juil for sending me a pair to test and review. Since I work at home much of the time, I wore them comfortably around the house. The best part is that we're having an unusually warm winter, so I even had the chance to walk around outside a little in them. I'm totally looking forward to the summer when I can just live in these sandals. First of all, they are really comfy. They fit nicely and the leather straps are smooth against my feet. 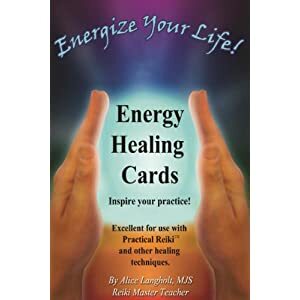 I noticed the benefits the most when I was intentionally grounding my energy after Reiki healing sessions or meditation. I really did feel like it was easier to feel more present faster than when I'm sporting my Keds or Bearpaws. All I had to do was think of bringing my energy down into the earth and back up into my body and I had an instant sense of being HERE, now. I think, besides doing the grounding exercise barefoot, the Juil sandals were the next best thing. So if you're interested in supporting a company that wants to support energy workers and those who are just becoming aware of the benefits of connecting to the earth, check out Juil.com. I also love that they've started a Soles for Souls program, where they donate a pair of shoes for every pair sold. Companies that do good like this are so awesome! By the way, they're also coming out with sneakers soon. This Midwest girl will be ready to click and place my order when that happens! I made this today...how do you view yourself? Last month, I went to a training in Controlled Remote Viewing. CRV is a technique that was developed and used by the military to get information about classified things by using the intuition in a very controlled, structured way. It's also been known as "psychic spying." I was trained in CRV with a group that was interested in its applications for healing. 1) All of the information about everything -really EVERYTHING- that there is to know about everything is here, right around us. 2) We can find out everything we want to know by learning to ask and learning to translate the information we receive. 3) Scanning someone's energy, psychic channeling, giving tarot or card readings, CRV, tuning in---these are all methods of asking for information and receiving that information. 4) Translating is how we bring the information we want to know into our conscious mind through our intuition. (From the right brain to the left). 5) There are many ways of learning to sense and translate this information into understandable answers. All we need to do is decide which method to learn and practice. When I work with Reiki, I use my hands. My intuition gives me messages through my tactile senses - called being clairsentient - which comes in the form of physical sensations of tingles, warmth, prickles, etc. Each sensation has a meaning, and through experience, I'm learning to understand what each one means. For example, one sort of tingle means a person is experiencing grief. One sort of prickle means there is pain in the area. Moving my hand over someone while Reiki is flowing allows me to receive these messages via my tingles - and I translate the messages into meaning that I can understand and discuss with my Reiki client. The tingles are the language of my intuition, and I'm learning it as a baby learns to talk -by being immersed in it and learning to discern the different nuances and attach meaning to them. When I'm scanning someone's energy, I'm asking for information about the state of the person's energy. Where is there pain, blockages, overactivity, etc.? This information comes to me, I translate it, and can dialogue with my client about what I sense. I feel the sensations change during the session and I know that the recipient has received what was needed for this session. CRV is a process of asking for information too. There is a Target, which represents the information the viewer wants to receive details about. The viewer doesn't know much, if anything about the Target at the start, and so all information received via the intuition is written down, and through the process of relaxing, tuning in, and writing, lots of information comes forth about the target. It's a very structured way of doing the same thing - asking for information and bringing it onto the paper. It's not psychic training - it's learning a language. They call it a martial art. But it's still the same idea - the information is out there and we can retrieve it. I teach my students to learn to identify and then tune in to their clairs - their own naturally strong way of receiving intuitive information. Because it's here. Today I had a very wonderful and amazing experience. While it's something I've done before, stepping back and looking at the gestalt of it, I'm blown away with amazement and gratitude that I am offered the opportunity to be a part of this work - it's nothing short of incredible. Today, I gave a Team Distance Healing to a woman in Congo, Africa, with my Healing Team friends, Tom and Cher. Last night, my internet connection went out. I was on the phone with AT&T Uverse Tech Support from midnight until 1 am, trying to get it fixed. It didn't get fixed, and a tech was dispatched to arrive late this afternoon. I knew we had this appointment for the healing session, so I took my computer to a nearby coffee shop to use the wifi. Then I thought about what was happening. Tom is in Texas. Cher is in California. Our client is in Congo, Africa. I was in a coffee shop in Ohio. We met up on Gchat, via Gmail. Together, we connected with our client's energy, scanned and talked about what we felt and sensed in her energy. We found things, we sent healing to clear them, we used the techniques that we were trained in. We felt the difference happening. Cher told us what she saw, Tom responded and I did too, and we felt the changes. Cher channeled a beautiful, applicable and inspiring message from our client's Guides. We all could sense when the session was complete. We felt like we had really accomplished a lot. So there I was, just outside the coffee shop, at a little table. People were walking by. But I was involved in this incredible experience and the outside world just kept moving along. I typed up the report of our session, plus the guidance received, and emailed it to the client. Within 30 minutes, we received an email from the client verifying that what we had done had been powerful for her, and that she felt lighter, loved, supported, guided, and ...better. "Like dancing" she said. I am filled with joy and gratitude to be part of this experience. I feel like a super hero. What is more magical than this experience?? I can't think of anything. Real magic, this work. And I had to share the experience with you just because ...well, there's nothing like it. We are capable of so much beauty, healing, magic, connection, intuition, and joy. And most of us, most of the day, walk around oblivious. It takes moments like the hour I spent this morning to be a powerful reminder of this truth. And I love being a part of it. 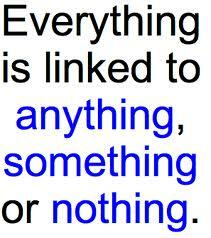 I told my dad on Friday night at dinner, we are connected to everything. We have access to all of the information in the universe. We only need to learn the methods necessary to train ourselves to receive the information we seek. Two weekends ago I was in Delaware for training in Controlled Remote Viewing and its applications for healing. I realized, it's all about accessing information. All of it. Just the act of connecting to another's energy and observing will activate a healing process. And intention amplifies that process. It was fascinating and just served to validate what I already have experienced. I also was taught that the more people who are "psychically" accessing a target, the stronger the signal will be. That also validates that healing with a team is more powerful than alone. But I already knew that too. Today is another perfect example of that insight. So I need to blog because I'm just overwhelmed with gratitude for the privilege of doing this work. For all of you who also give Reiki, you know how I feel. For those of you who haven't yet learned it, I would be honored to teach you, advise you, and help you discover that anyone can learn this too. I'm not special, I tell people. I just learned to do something extraordinary. You can too. If you are interested, contact me. I'm here to help. My kids are regular kids. When your kids are energy-aware, though, play has an added dimension to it. There are more topics that end up incorporated into their role-play games. The perfect example is what we did yesterday. My kids have been developing a skit called Chakra Tony's Metaphysical Outlet. Yesterday we video recorded it and put it up on Youtube. The reason this is significant is mostly the reminder that we should never take ourselves too seriously. Yes, I'm passionate about Reiki and deeply spiritually connected to this powerful work. But it's also important to remember to have a sense of humor. We can poke fun at ourselves and have fun and that's important too. Now I'm passing it on to you. Enjoy.